The economic powerhouse has slowed of late, but despite European regulatory changes underway – fibre costs, exchange rates, environmental targets – Germany’s strong costs base points towards continued strength. The German tissue business has a long history, beginning with a patent on a paper handkerchief registered in January 1929 by Nuremberg papermaker Oskar Rosenfelder. He also trademarked the Tempo trademark in Germany which became eponymous like the Kleenex brand in the United States. Germany developed a strong tissue industry and consumer culture with recognisable features like a preference for multi-ply and robust tissue sheets. 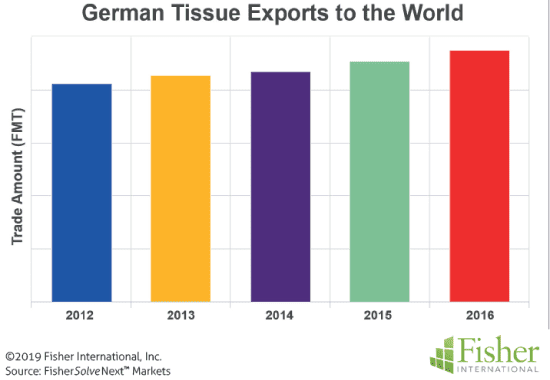 Germany currently enjoys a strong economic position in Europe to go with its early start in the tissue business. However, economic growth rates have moderated. Figure 1 shows a cumulative average growth rate (CAGR) of 1% population growth for the 2012-2017 period and CAGR of 2% growth in GDP. Unemployment fell from 5.4 to 3.8% over the same period. Germany is a major exporter of high value-added goods. Although the country’s population is growing very slowly, there is still room to increase tissue consumption per person. The average German consumer uses about 19kg of tissue per person compared to almost 23kg in Sweden or 16.5kg in the United Kingdom. These are high consumption rates compared to global standards, but slightly below the 24.5kg consumption seen in the United States. Increased per capita consumption rates in developed economies tend to come from increased use of existing products, such as household paper towels, as opposed to new tissue formats. 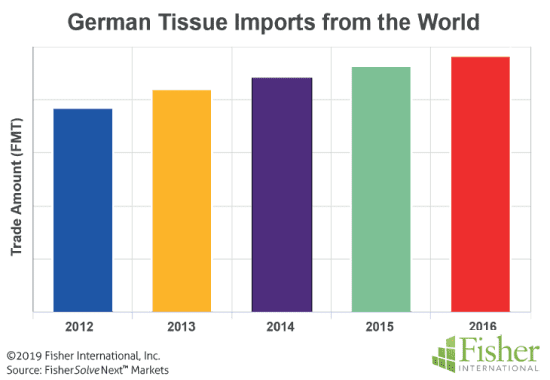 Germany maintains a slight surplus in global tissue trade. Figures 2 and 3 show the progression of its tissue exports and imports in finished metric tonnes (FMT) over the most recent five-year period. Its world tissue exports amount to 31% of its total production capacity almost in balance with imports at about 29% of total production. Furthermore, this trade is about 98% focused on Germany’s neighbours in western and central Europe. 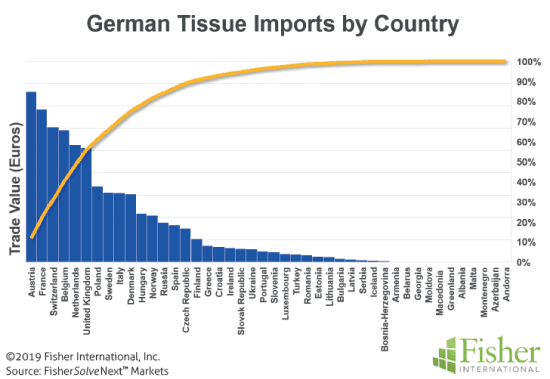 Figures 4 and 5 provide Pareto charts showing tissue imports and exports valued in Euros averaged over the past five years. Most of the top trading partners that account for over 80% of the tissue trade are immediate neighbours with relatively stable two-way trade. This is important in the analysis of Germany’s tissue business as it shows a focus on domestic markets with balanced tissue trade. Overall tissue furnish is shown in Figure 7. Recycled fibre makes up about 37% of the total. 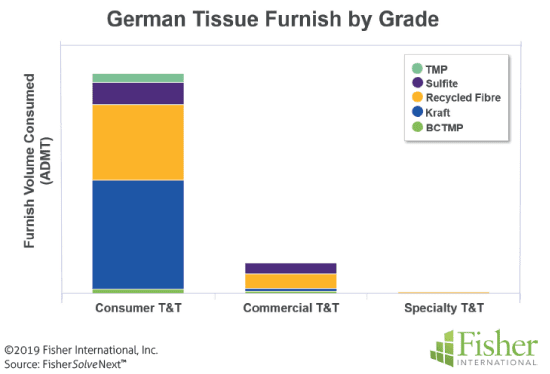 German tissue makers purchase approximately 35% of tissue fibre, producing the rest on site. The first mix diversity and tissue mill fibre integration provide a stable base for the continued future of tissue production. Tissue furnish is further broken out by grade in Figure 8. Both specialty and commercial tissue grades use significant percentages of recycled fibres, but the large consumer grade recycled consumption outweighs these amounts. The country’s tissue manufacturing capacity also includes several machines with advanced tissue technology such as TAD. 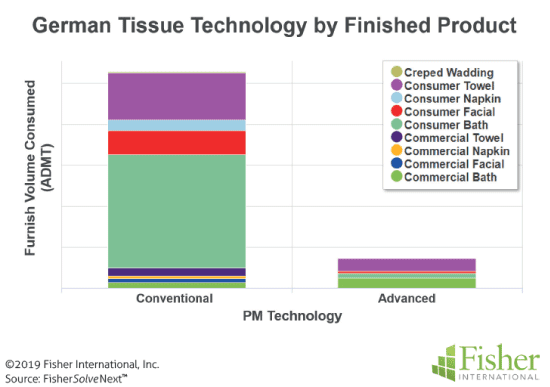 About 12% of tissue capacity is advanced technology. This is a much smaller proportion than in the United States. Recycled fibre makes up about 37% of the total. 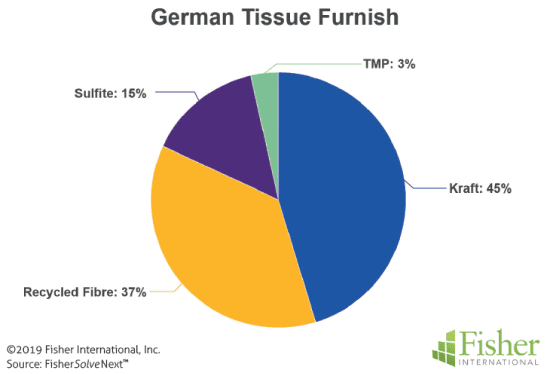 German tissue makers purchase approximately 35% of tissue fibre, producing the rest on site. The first mix diversity and tissue mill fibre integration provide a stable base for the continued future of tissue production. 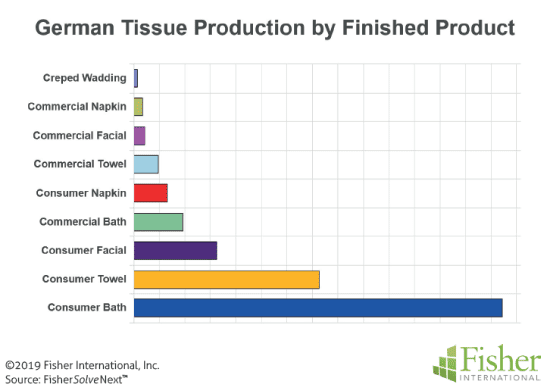 Figure 9 shows that product distribution for advanced tissue technology is focused on retail towel and commercial bath tissue. TAD is well known for superior retail kitchen towels around the world, but the German focus on commercial bath shows the differences in consumer preference for toilet tissue products strength and multiple plies and advanced technology between Europe and North America. TAD commercial bath appears to make more sense in Germany than the United States. In the United States, retail bath tissue is the TAD or advanced technology target kitchen towels. 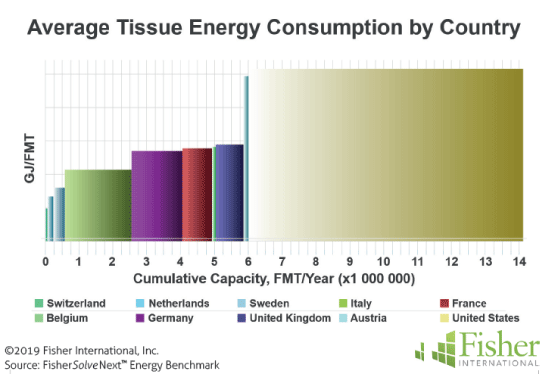 The slow growth in Germany’s tissue consumption has limited capacity additions. Only two tissue machines were added in the 2007-2008 period, and one machine was shut down in 2015 with no further additions planned. The net effect is a gain of only one machine in the past 12 years. With that in mind, it’s important to take a look at the relative quality or competitiveness of Germany against relevant benchmarks. Figure 10 plots the average machine speed versus average machine technical age for Germany’s immediate neighbours. The United States was also included to provide a broader reference point. The size of the bubbles represents the relative capacity of each country. Germany’s average tissue machine is faster than all of the reference countries. 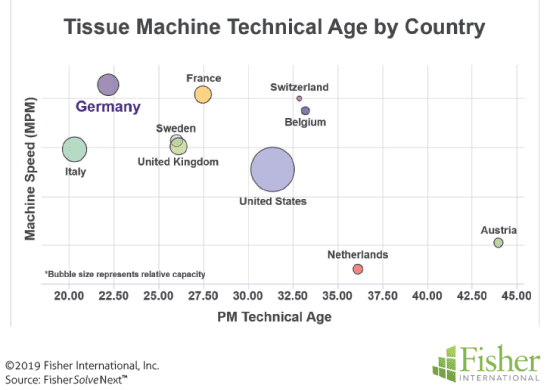 Its average technical machine age of about 21 years is more up-to-date than every country plotted except Italy. Its average tissue capacity looks very strong by this measure. tonne of tissue. Germany has a very low water consumption rate compared to every country except Switzerland. Sweden has the lowest overall water risk and perhaps not surprisingly, slightly higher water consumption per tonne. 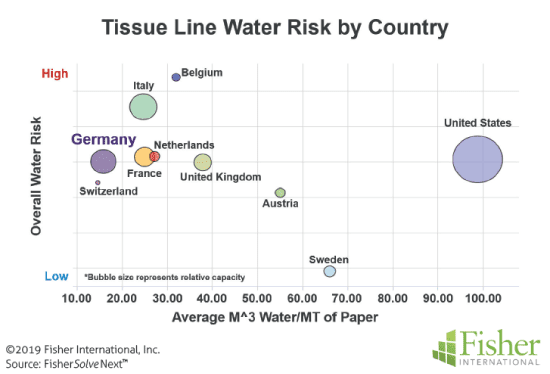 The outlier is the United States with an average risk equivalent to Germany but several times more water consumption per tonne of tissue produced. Germany appears to be well positioned on a water sustainability metric. Energy is the other key sustainability metric. Figure 12 provides a comparison of the same reference set of countries as Figures 10 and 11. German tissue making average energy consumption per tonne is in the middle of its immediate neighbours and trading partners. Like the previous water efficiency and risk chart, the United States data is provided as an out of area reference. Here we see a much higher energy consumption per tonne of tissue production in the United States where energy is relatively inexpensive by Europe standards. 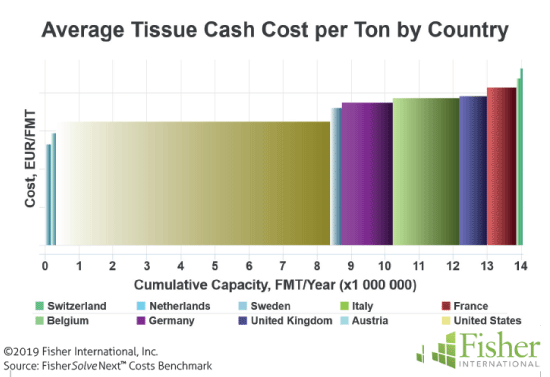 The average cash cost to produce a tonne of tissue for Germany and the reference set is shown in Figure 13. Germany is in a lower cost position to the other major European producers of Italy, France, and the United Kingdom. 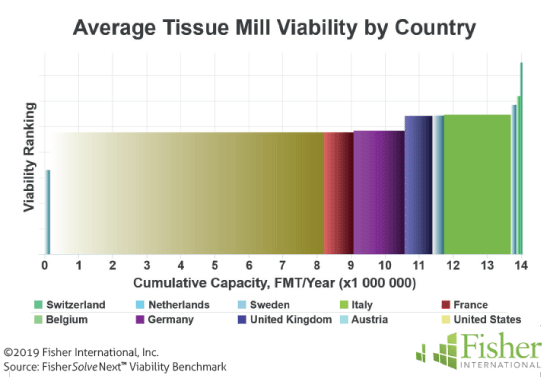 The lower reference costs of the United States tissue business reflect lower energy costs and the benefits of a more significant percentage of integrated tissue mills. 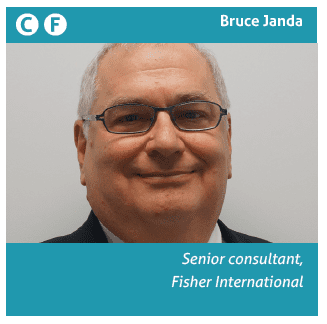 Figure 14 provides a look to the future by calculating an index from key business sustainability factors. 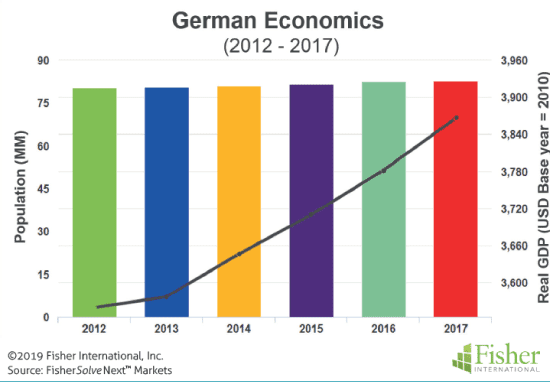 Germany again looks very strongly positioned for a successful future. preferences will continue to evolve, making TAD either more important or less – and future pulp and energy prices will affect TAD adoption, too. Fisher International supports the pulp and paper industry with business intelligence and strategy consulting. Fisher International’s rich databases, powerful analytics, and expert consultants are indispensable resources to the industry’s producers, suppliers, investors, and buyers worldwide. FisherSolve™ is the pulp and paper industry’s premier business intelligence resource. Complete and accurate, FisherSolve is unique in describing the assets and operations of every mill in the world (making 50 TPD or more), modeling the mass-energy balance of each, analysing their production costs, predicting their economic viability, and providing a wealth of information necessary for strategic planning and implementation. FisherSolve is a product of Fisher International, Inc.
Share the post "Germans are serious about sustainability, and it’s driving the nation’s tissue performance"